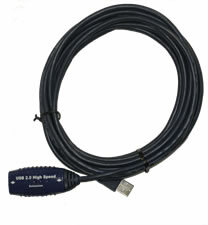 The Radiolabs USB 16 Foot Active Extension Cable is an active device. The USB signals going in and out of the extension cable are buffered to assure signal quality and the meeting of the USB's electrical timing spec. RadioLabs USB Active Extension Cable allows a USB device to have its cable length extended 16ft. The USB extension cable acts as a USB hub and buffers all downstream and upstream data traffic. High speed, low speed and full speed devises will function equally well with the USB extension cable. The USB Active Extension Cable can extend your USB cable length up to 16 feet and still power your USB 1.1 or 2.0 device! All you have to do is plug the USB 's connector into the cable from your device and plug the other end into your computer's USB port. There is no setup and no software needed! The USB Active Extension Cable is the quickest and easiest way to extend your USB cable.